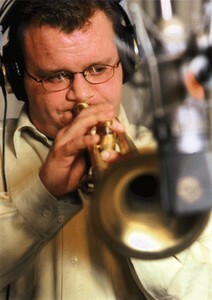 I really enjoy listening to Ryan Kisor take solos on the trumpet. His trumpet solo on the tune Candy from The Sidewinder album is very melodic sounding and fun to sing or hum along with. Ryan Kisor nails all the changes in this Candy trumpet solo and there are a quite a few Jazz licks to take advantage of as well. Candy is a basic rhythm changes tune where the bridge of the tune progresses in fourths. I love tunes like these because they are what most Jazz standards use. I would love to hear what you think of Ryan Kisor’s solo. Hi – thanks for your site – some cool ideas. Shame that there is only the photo of Mr Kisor here. I’m not familiar with his playing (I’m a know-nothing guitarist :-)), but sthere is now virtually no chance of me knowing what he sounds like, and even less chance of me ever wittingly buying a CD with him on it. Three cheers to the corporate music police! But THANK YOU Sweets for taking the time to communicate your knowledge. Very good site, where did you come up with the knowledge in this piece of content? I’m happy I found it though, ill be checking back soon to see what other articles you have. I just take it one step at a time. Even while It is my opinion your post is on the appropriate path there are actually one or two factors that i don’t agree with. Let me tell you…without doubt my fave superstar right now. What a great performer. Just wonderful! I loved the trumpet solo. I completely agree. That is pretty much how I understand it. Cheers! Excellent information. Great post, have a good day!